"This cauliflower salad combines hard-boiled eggs, shaved carrots, and green onions with a creamy dressing for a side dish for any occasion." Bring a large pot of lightly salted water to a boil. Cook cauliflower in the boiling water until tender, about 10 minutes; drain. Mix cooked cauliflower, hard-boiled eggs, carrot, green onions, sweet pickle relish, mayonnaise, and mustard in a large bowl; season with salt and black pepper. Really enjoyed this recipe. As my husband said, it is a crunchy potato salad without the potatoes. I used raw cauliflower rather than cooking it. I really enjoyed this. 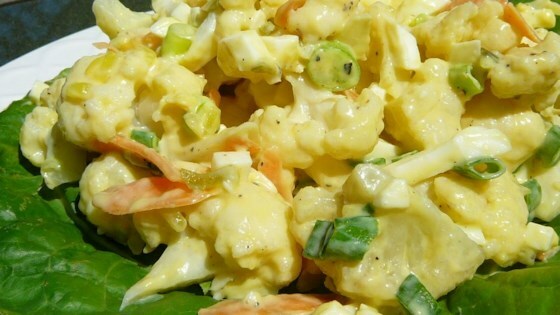 It tastes just like egg salad but but the nutritional benefits of cauliflower. I make exactly as written and served with whole wheat pitas. I am completely won over with this recipe! It is so easy, and scrumptious. I will never have to worry about what to do with extra cauliflower again. A good substitute for potato salad. Used Sandwich Spread and may. Didn't add extra pickle relish. Love the crunch! I just added some cilantro and dill.